One year after Achim Freyer's Ring Cycle at the LA Opera – majestic, experimental, and, as our correspondent Adeline Mueller put it, dangerous – the West Coast is the home of another important production of Wagner's tetralogy. Francesca Zambello brings her vision to the San Francisco Opera, with a cast featuring Nina Stemme, Mark Delevan, Anja Kampe and Elizabeth Bishop. The first three instalments are co-productions with the Washington National Opera, while Götterdämmerung represents a company premiere. The reasons to be excited for this Ring Cycle are innumerable: it is an impressive collective undertaking (more than four-hundred people are involved between stage and pit); it is accompanied by a host of activities and conferences in the Bay Area; and, finally, it is an economic challenge in a time in which cultural institutions are struggling. In short, the Ring stretches every resource of an opera house to the limit. It is, therefore, a special achievement that this company has pursued and realized such a complex project. As Zambello explained in the past, and as she reminds us in the programme notes, the main source of inspiration for this Ring was America itself – its landscape, its history, its political and economical struggles. The arid beauty of Red Rocks, Colorado, the wars in Vietnam and in Iraq, and past ecological disasters are combined to give shape to a revision of Wagnerian imagery. Washington, DC itself, where part of this Ring was conceived, was an important symbol as the institutional locus of power in the US. How is the San Francisco Ring different from its original Washington instalment? In the highly informative programme notes, Zambello offers her own view: "In San Francisco, where people have a keen consciousness of nature and the environment, we placed more emphasis on despoliation. Is there a major river in the US that hasn't been raped like the Rhine as the brooding E-flat chords begin Das Rheingold? From the [mushroom] clouds of Los Alamos to Three Mile Island [a near nuclear meltdown] and the BP oil spill; the natural resources that built this country have been on an inevitable path to destruction. How do we rebuild them? […] The western shore is out last chance for reinvention. […] We can't keep moving forward." Does this Ring fulfil its promises of engaging with the complex themes it underscores? Does it manage to consider the critical differences between these themes or does it paint a homogeneous picture? Experiencing the entire tetralogy, including changes made since previous versions, will be necessary to address these issues. 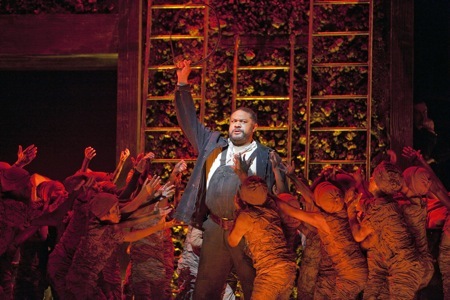 The first instalment, Das Rheingold, was presented on 14 June at the War Memorial Opera House. The low E-flat that famously opens the tetralogy emerges against a video projection of smoke-patterns that slowly turn into waves, and finally into a waterfall. This is the first of many video projections designed by Jan Hartley that punctuate this production, both as a backdrop – as in this case, or during the (slightly too noisy) scene changes – and as part of the narrative – for example, during Alberich's transformation into a snake, in which the snake itself is a moving image in the background. In some cases, these projections prove to be functional: they enhance the temporal and spatial coordinates, adding a sense of profundity, tri-dimensionality, or perspective. This is the case, for example, during the interlude leading to the Nibelheim scene, in which we are presented with images conveying a claustrophobic downward movement into the depths of the earth. Yet, due to the frequency with which these projections are used, sometimes they become distracting, and the images on the screen are repetitive or seem redundant. The opening scene was dominated by the vocal precision of the three Rhinemaidens, Stacey Tappan, Lauren McNeese, and Renée Tatum. Their singing could have been softer at times; nonetheless, they were rhythmically accurate and interacted harmoniously with each other. Gordon Hawkins's Alberich wasn't a truly convincing character. His acting was problematic; he never seemed comfortable in his interaction with the Rhinemaidens. Yet, my impression of his performance wasn't completely negative: though the orchestra occasionally overpowered him, he still managed to convey his lines with the right dose of lavishness, arrogance and naïveté. Mark Delevan offered a good performance, even though I find his tone somewhat coarse, especially in the higher register, and his voice is not as powerful as the role requires. On the other hand, his delivery was strong and clear, if never particularly heart-felt – but perhaps that was part of a characterization that he and the director were pursuing. In fact, his Wotan came across as a ruthless yet somewhat passive pawn: this was evident from the way he related to those characters whose destiny hinged on his decisions – especially Fricka. 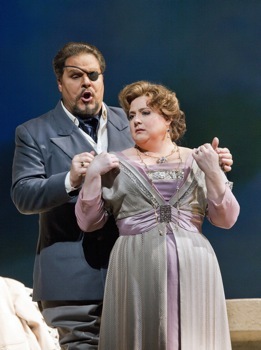 It was Stefan Margita's Loge who dominated this opera from a dramatic point of view: his physicality was well suited for the character, and he exploited the entire stage space with great ease. Moreover, I found his vocal performance to be quite peculiar: his timbre had an almost Italianate quality, and it clearly stood out from the rest of the cast. 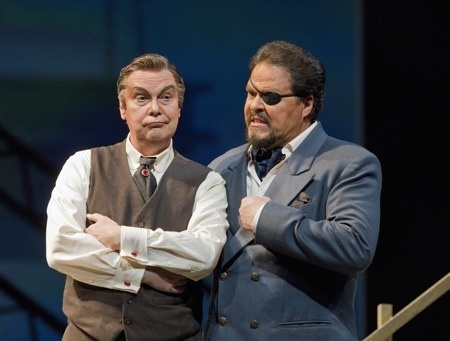 Dramatically, this anomaly produced an interesting sense of displacement for his character – one that works well for the role of Loge – a kind of Shakespearian ‘Puck’ within the architecture of Das Rheingold. 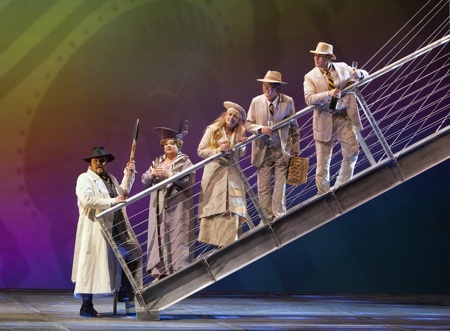 One of the characteristics of this Rheingold cast is that, notwithstanding the presence of some fine performers, few seem to possess a truly Germanic timbre. One exception is Elizabeth Bishop [an interview with her is forthcoming]. Her Fricka dominated in both vocal and acting terms, and like Loge, she often managed to steal the spotlight. Her timbre is perfectly suited for this role: she delivered her lines with competence and warmth, emphasising the most compassionate – and yet vigorous – aspects of Wotan's wife. Brandon Jovanovich's Froh and Gerd Grochowski's Donner offered some comic parentheses within the dark unfolding of the narrative that will lead to the destruction of the world of the immortals. Unfortunately, Grochowski presented some uncertainties on the vocal side. Similarly, Melissa Citro's Freia was unconvincing in both vocal and dramatic terms. Andrea Silvestrelli's Fasolt was moving as he delivered his lines with strength and conviction. And Daniel Sumegi, interpreting Fafner, took some time to warm up, but eventually offered a successful performance. Choreography by Lawrence Pech was finely conceived, and came puissantly to life in two scenes in particular. The first is the one in Nibelheim, featuring the enslaved Nibelungs – interpreted by children and other supernumeraries – and a convincing Mime played by David Cangelosi. The second is the subtle final scene: the gods – except Wotan – were opening their champagne bottle on the bridge leading to the Valhalla-skyscraper, while the cry of the Rhinemaidens suddenly emerged. Wotan stood still and appeared to be disquieted, but just for a moment. As he walked toward the bridge to join the rest of his family, the Rhinemaidens manifested themselves as beggars, dressed in black and reaching their hands toward an unconcerned Wotan. Loge, instead, was standing toward the border of the stage, closer to the audience. He observed the scene, pitying the gods, and knowing that their mindless joy is but the beginning of the end. This scene was for me emblematic of this Rheingold: an absence of solemnity and a sense of empty formality accompanied the ascent of the gods into Valhalla. As for the orchestral rendition, Donald Runnicles's light touch characterized this performance. It will be interesting to see how he approaches the remaining operas: I felt like he didn't completely explore the palette of colours and dynamics – especially in some highly charged moments, such as the opening scene, and during the moments in which the curse motif comes to the surface. Moreover, the brass section presented some uncertainties. Nonetheless, the communication between stage and pit was excellent, and the mutual understanding between the musicians and the conductor was reflected in a harmony perceivable in the auditorium. In conclusion, this Rheingold was for me an uneven accomplishment, but its success lies in its ability to spur reflection and to convey a sense of expectation for what is yet to come. And if the production of Die Walküre that the SF Opera put on stage in June 2010 was representative of what's to come, we can be sure that this Ring will be an achievement of which the SF Opera can be proud.